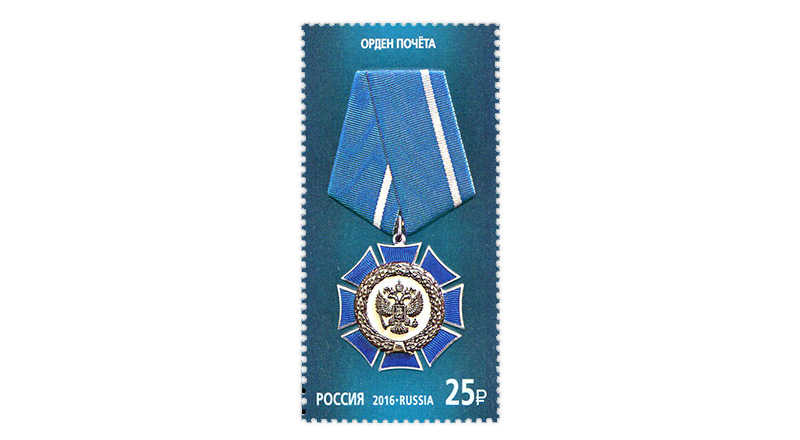 COLLECTORZPEDIA: Russia 2016 - State awards of the Russian Federation. Continuation of the series. 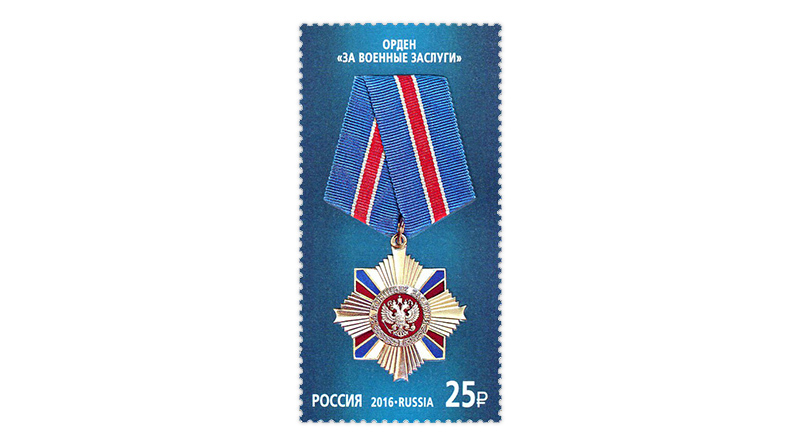 Russia 2016 - State awards of the Russian Federation. Continuation of the series. 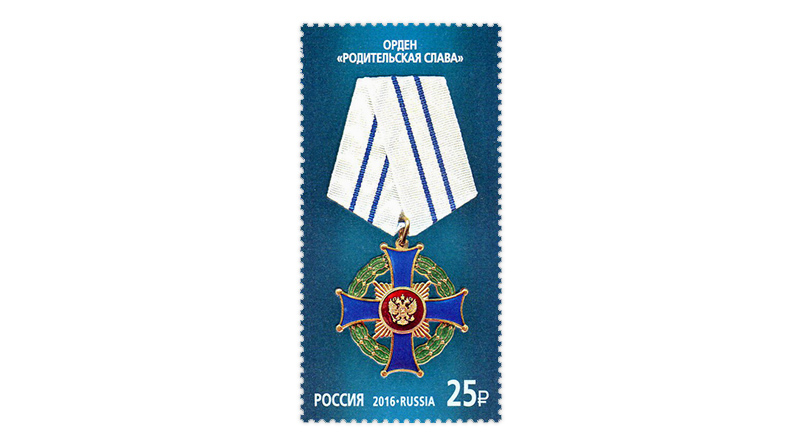 State awards of the Russian Federation are the highest form of recognition for outstanding services delivered by citizens in the defense of the Motherland, in the development of the state, in the fields of economy, science, culture, art, education, pedagogy, protection of health, lives and rights of the citizens, charitable activities and other outstanding services rendered to the state. State awards are instituted and awarded by the President of the Russian Federation. 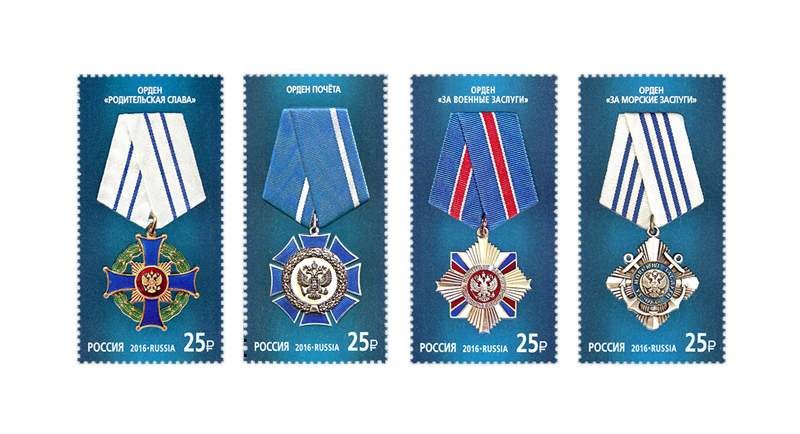 The postage stamps feature the Order of Military Merit, Order of Naval Merit, Order of Honor and Parental Glory Order. The Order "For Military Merit" was founded in 1994. The Order of Military Merit is awarded to military officers for high levels of troops’ combat readiness and defense capacity of the Russian Federation; for courage and selflessness displayed in performing military duty; for high personal skills in the employment activity and professional development ; for the bravery and dedication which had shown during the performance of military duty in the course of combat or training - combat missions; for merits in strengthening comradeship-in-arm and military cooperation with foreign countries. The Order of Naval Merit was founded in 2002. 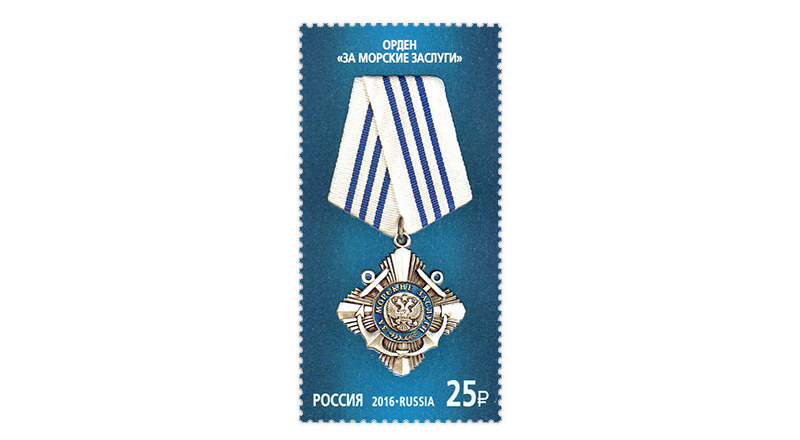 The Order of Naval Merit is awarded to Russian citizens for merits in the study, development, and use of the oceans, as well as developing and introducing new technologies and equipment for the Russian marine fleet; for merits in maintaining, expanding, researching and using of the exclusive Russian economic zone in the World ocean; for merits in protection from see robbers and poachers; for expertly organized and conducted naval trainings and maneuvers; for merits in the development, organization of production, construction and efficient operation of modern high-tech Russian civil and commercial fleets. The Parental Glory Order was founded in 2008. The Parental Glory Order is awarded to parents (adoptive parents), who have raised seven or more children (Russian citizens) in accordance with the family law of the Russian Federation. Rewards parents (adoptive parents ) and their children form socially responsible family and lead a healthy lifestyle , provide a high level of healthcare, education, physical, mental and moral amplification of children, full of harmony of their personalities are an example of the strength Family Institute and parenting.